Remember this sign? If you do, you probably grew up in the 50’s or 60’s or saw one that had never been removed from a designated fallout shelter. We saw these signs on Washington Elementary School, down the block from where we grew up. I remembered one we could see from the playground — an ever present reminder that our game of dodgeball could be interrupted by nuclear attack. We would have Civil Defense drills, where we would file from our classrooms to the basement of the school building. 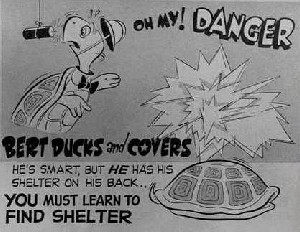 Others remember “duck and cover” drills hiding under school desks, which was better than going to the windows to see what was happening–marginally. Where I lived on the West Side of Youngstown, we were within a mile or so of the steel mills, as were many living in the city. Given that we were the third largest steel manufacturer at the time, many considered the mills would be a prime target in case of a nuclear attack. Given our proximity to the mills, I’m not sure whether any of these measures would have resulted in our long-term survival, even if we survived the initial blast. What I do know is that these scared the heck out of us as kids. If nothing else, it got me to say my prayers at night! October 1962 was an especially scary time. I was in third grade and I remember the night none of us did any homework, when President Kennedy came on all the national networks with photographs detailing the construction of missile silos 90 miles from the United States in Cuba. This brought us into a direct confrontation with the Soviet Union and Nikita Krushchev–only later did historians reveal how close to the brink we got to a nuclear exchange. Even with what they told us, it was enough to make us wonder if we would live to see another Halloween, let alone Christmas. 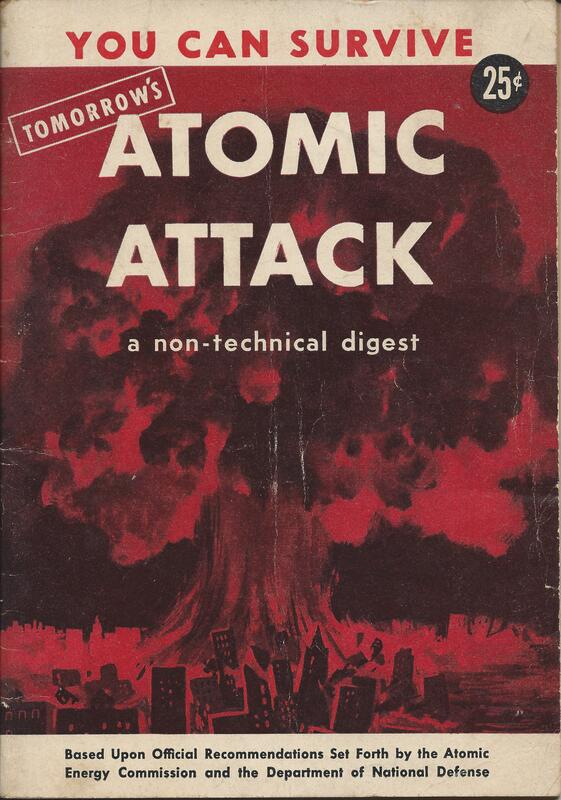 The literature of the time talked about surviving nuclear attacks. No one discussed what kind of world there would be afterwards. 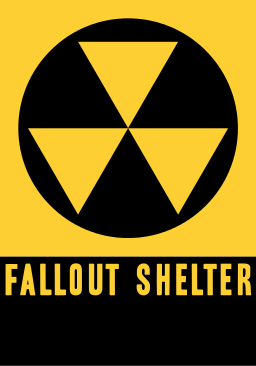 I don’t know anyone who did this but people built their own fallout shelters and stocked them with supplies. 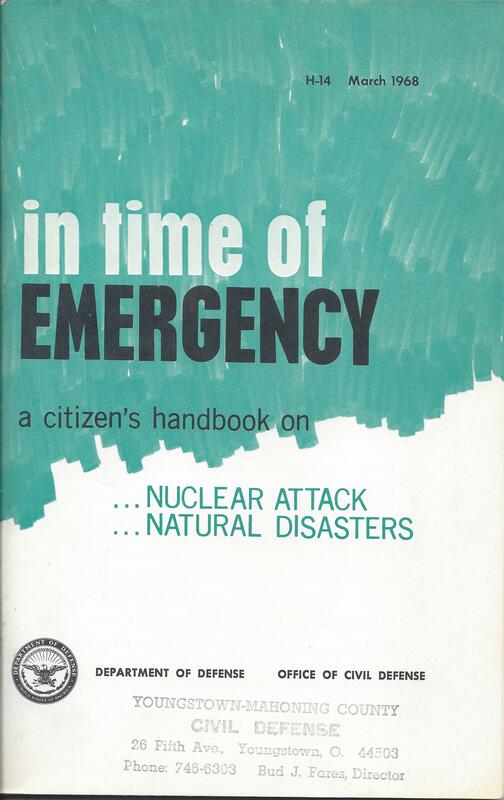 Various agencies published pamphlets on what to do to survive a nuclear attack. My wife still has a couple of these, the covers of which I’ve scanned. Most of the time, we pushed these fears into the background, although we often heard politicians talk then of “the Red Menace” as they do of “terrorists” today. Fostering fear often has been a good way to get elected. Remember the ads Lyndon Johnson ran against Barry Goldwater showing a little girl picking the petals off a daisy against the backdrop of a mushroom cloud? Beginning in 1968, a series of treaties reduced our nuclear stockpile from nearly 30,000 to 7100 (with roughly 1600 actual warheads deployed and Russia having roughly the same). But it seems we’ve traded one set of fears for another in the years following 9/11, with Offices of Civil Defense being replaced by Homeland Security and “duck and cover” being replaced by airport screenings, “shelter in place” drills, and electronic and video surveillance of our lives. Actually, I wonder if the attitude I saw in most of the adults I knew in Youngstown is the most healthy one. Being religious, they commended their souls to God and then went and did their work, cared for their families, enjoyed good food and drink and the other good things life brought, and didn’t pay too much attention to the scare-mongers. The real dangers in life were closer — a work injury, an auto accident, a cancer diagnosis. They didn’t spend too much time on the unthinkable and tried to make the most out of their lives when work was good and their families were healthy. Maybe it is a more dangerous world today. No students ever died from nuclear war in the US, which we cannot say with regard to gun violence and mass shootings. Yet I wonder if the commonsense approach to most fears by our parents under the cloud of nuclear war [which did include anti-war and anti-nuclear advocacy that made a difference] might be something we could learn from. They understood that the good life is not one controlled by fear. Might our working class parents have wisdom for our own day?